This post was done in partnership with Dell. Wondering how our founder Sarah Boyd started SIMPLY, or what her day-to-day life at the office is like? We teamed up with Dell and McAfee for their Small But Mighty contest to show how Sarah runs SIMPLY. When I started SIMPLY almost six years ago, it was just me and a laptop. My home was my office, but I was always on the go, taking meetings at coffee shops, traveling to meet potential clients, and working nonstop. When you're an entrepreneur with a new business, you're always on the job. My laptop was everything. Since then, SIMPLY has grown so much—we've held conferences not only in Los Angeles but in New York and Dubai, our team has expanded, and we now have NYLON as our parent company—but SIMPLY is still a small business through and through. 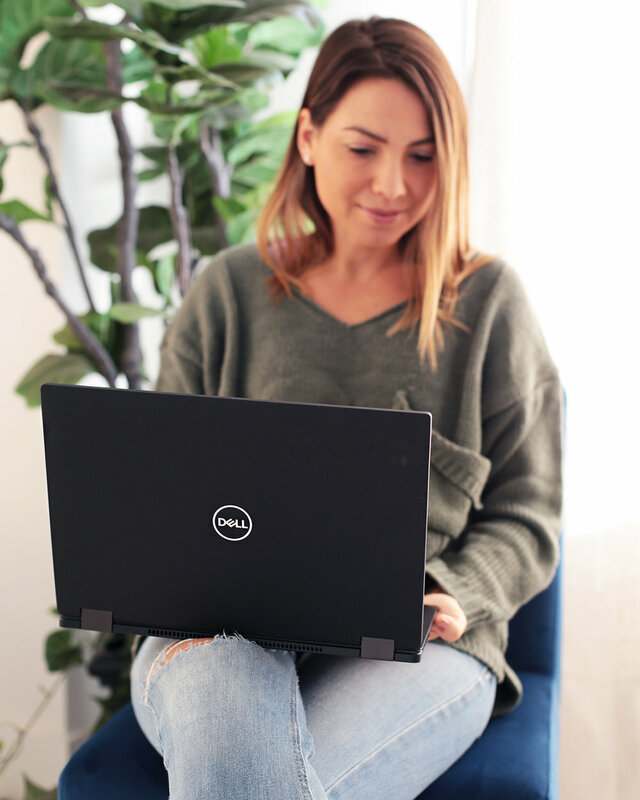 I still use my laptop every day, and lately I've been using the Dell Latitude 2-in-1 Laptop. From answering emails to editing blog posts on the SIMPLY website, I'd say 90% of my day-to-day job involves my computer. I need a computer that's reliable and easy to transport. Meetings and events take me all over the place, so I love that the Latitude is adaptable and portable, too. Being able to work from anywhere was so important when I was starting out, and even know I rely on my laptop since I'm constantly traveling. One of my favorite features of the Latitude is that you can actually flip it around and turn it into a tablet. If I'm checking emails or taking a break and browsing social media, I'll use the tablet mode to scroll through. If I receive an email and need to respond, I can just flip the screen back around and type up a response. Or if I'm on a walkthrough for an upcoming conference, I can use my stylus and make notes in real time. Because there's so much important information on my computer, it's great that my laptop comes with security from McAfee, too. The majority of my work is done online and on my computer, so if anything were to happen, it's reassuring to know I have a way of keeping all my files safe and secure. My job keeps me on the go, so having a laptop that's portable and adaptable is so essential. Just like the Latitude allows me to mix up how I work, I love to change up my work environment every so often. The SIMPLY office has several great spots to sit and work (including an outdoor patio—my favorite!) so once in a while I'll sit outside my office to get a change of scenery and some fresh air. It's a great way to get the creative juices flowing, so you'll often find me sitting outside on our patio or on the sofa in our lounge if I'm in need of inspiration. Even though SIMPLY has grown a lot over the years, we're still a small business that relies on having dependable tools that help us get the job done. With my Latitude, I know that I'll be able to work efficiently wherever this crazy job takes me. Are you a fellow small business owner? Share your story with Dell and McAfee for their "Small But Mighty" Contest in celebration of Small Business Saturday on November 25. You could win THREE Dell Latitude Laptops to help power your small business!